As noted in Abraham and Ann’s post, they had eight known children. Based on some significant gaps between children, I suspect that there may have been more, but I have no documentation to support any other births. Truthfully, I feel as though I’m missing a lot of stuff and just have the basics. In the early 19th century we are dependent on the christening and burial records of the church, and these could be spotty at best. Not all children (even in the same family) were baptized and not all records were preserved or have been filmed. From an undocumented Walker family bible. It is not likely Abraham or Ann’s based on the entries. The recorded dates of birth for their children were all done at the same time (no variation in hand or ink except for Abraham’s middle name), but the children below were added later. Also the children below are the 1st child of Abraham (Jr) and the first 3 of John’s 4 children. Let me just take one moment to thank the brilliant people who had the foresight to preserve the Oliver Bair Funeral Home records from Philadelphia and allow Ancestry to get them out there. These records have proven invaluable for added information not only about the event, but also about children that we might not have known about or been able to tie to the family otherwise. 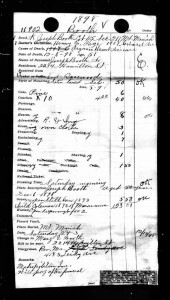 The 1898 funeral record of Joseph Booth with costs and info about the removal of the babies in the grave. *note* It is too cumbersome to provide all the source data here for the grandchildren of Abraham and Ann. I’ve provided birth and death (if known) – for more information, the BurgraffScott tree on Ancestry has those sources as will (eventually) the individuals on the tree on FamilySearch. 4. Walter Saxon (1878-aft 1942). I searched for Mary Ann for a long time, but I had to wait for the right records to become available before I found her. Hey, that’s my story and I’m sticking to it. I’m not going to admit that I failed to look at her mother and see if Mary Ann might be buried with her, thus coming up with her new married name. I will tell you that my cousin Jamie was great about digging out the information once the right question was asked. 1. Robert Booth b. 22 Sep 1870, d. 6 Jan 1918, m. Caroline (Unknown) b. 6 May 1860, d. 1 Jan 1904. They had no known children and were buried together in Mechanics Cemetery, but when it closed, they were relocated to Mount Peace Cemetery. 3. Stillborn Boy Booth b.1873, d.1873, buried Mount Moriah. We know of this child from the notes on Joseph’s funeral record. The stillborn child was disinterred for placement of Joseph’s casket and then reinterred with him. 4. Gertrude Booth b. 12 Apr 1879, d. 24 Nov 1955, m. James Peter Hain on 26 Apr 1899. James (1873-1944) son of Peter Hain and Sarah J. Else. Both Gertrude and James were cremated but they have a headstone in Arlington Cemetery, Drexel Hill, Delaware County. They had six known children: Stella Gladys, James B., Ruth, Frank Orme, Margaret S., and Ralph E.
5. Joseph Barber Booth b. 15 May 1885, d. 1 Jul 1945, m. Catherine Smith 11 Jul 1906, Atlantic City, Atlantic, New Jersey. Catherine b. 30 Mar 1885 in Scotland, d Jul 1966 Atlantic City, Atlantic, New Jersey. It is not yet known who her parents were or when she immigrated. Joseph Barber Booth was cremated. They had seven known children: Annie, Joseph William Smith, John W., Robert D., Joseph, Dorothy W., and Gladys. 6. Alice Booth b. 15 Dec 1887, d 10 Jan 1974, m1 Edward L. Hallahan on 8 Jan 1904. Edward L. Hallahan b. 23 Jul 1883 Ireland, d. 27 Apr 1924, b. St James of Kingsessing. M2 William Hynds Jr. on 3 Sep 1924. Alice and Edward Hallahan had eight known children together: Edward, Joseph, James, Thomas, Alice, Catherine, John, and Eugene. Alice and William had no known children together. 1. Eleanor Mary Walker, b.3 Nov 1876, Philadelphia, d. 16 May 1919, Pittsburgh, Allegheny, Pennsylvania, m. Joseph Edward Bernish in 1894. Joseph b. 30 Jan 1867, Birmingham, Allegheny, Pennsylvania, d. 25 Jun 1958 in Pittsburgh. He was the son of Thomas and Mary Ann (Davis) Bernish. Eleanor and Joseph are buried together in the South Side Cemetery. They had ten known children together: Irene Clara, Joseph Edward, Eleanor Mary, Thomas, Ralph Earl, Martha Elizabeth, Anna Luella, Thomas Abraham, Jean Adele, and Theresa May. 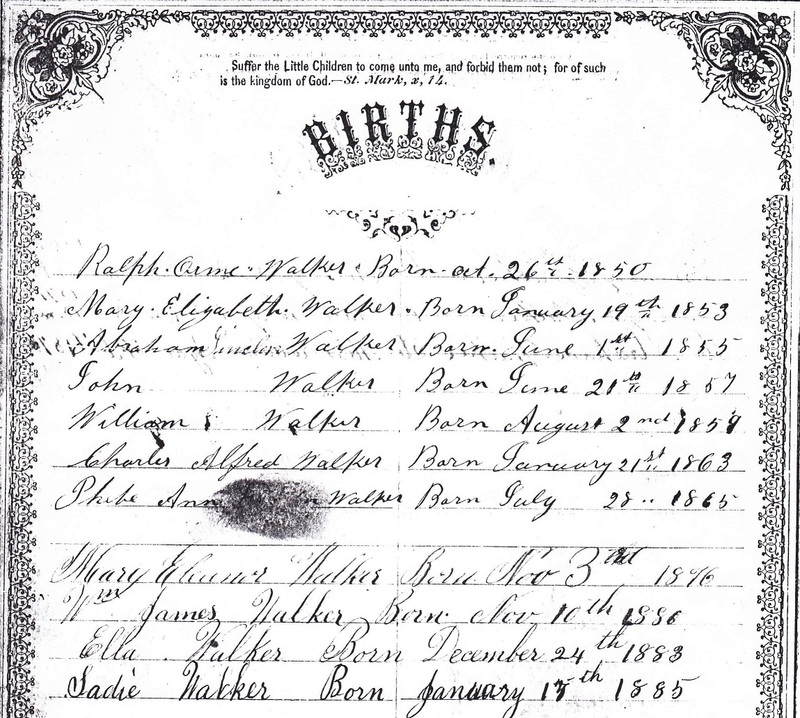 The family story handed down through Abraham’s line is that Eleanor (Agar) Walker’s parents wanted Abraham to give up baby Eleanor to them after her mother’s death. Abraham refused and relocated to Pittsburgh. They followed and to get them to give up their pursuit and probably out of fear they might sue for custody or simply take the child and disappear to Ireland, Abraham finally showed them a grave and told them the baby had died. The Agars apparently departed back to Philadelphia. It’s a great story and may have some basis in truth as single fathers were not the norm in this era and babies were usually given to grandparents or siblings to raise if the mother died. I find no evidence that the Agars intended to return to Ireland. Most of the Agar family (parents and siblings) were interred in the family plot with Eleanor at the Odd Fellows Cemetery. Abraham died from cancer of the bladder in Pittsburgh on 9 Jul 1920 and was buried 12 Jul 1920 in the South Side Cemetery.20 Theresa did not remarry. She died 5 May 1936 in Oakmont, Allegheny County and was buried on 7 May beside Abraham. A quick note here about Abraham’s name. Several trees have him listed as Abraham Lincoln Walker. He apparently adopted the Lincoln name in honor of the late president after his assassination, but he wasn’t named that by his parents. He was baptized as Abraham Walker in 1854, long before Lincoln was a blip on the national radar. There is a family bible that lists the children of Abraham and Ann and the list appears to have been created well after the fact as the writing is all the same. The name Lincoln looks as though it was added at a later date. There’s no issue with his name – Abraham can call himself whatever he likes. I’m merely clarifying that Lincoln wasn’t part of his birth name. 1. William James Walker, b. 10 Nov 1880, Pennsylvania, baptized 25 Mar 1883, Church of the Redemption, Philadelphia. Found in the family bible and baptismal record, but not thereafter. 2. Ella Walker, b. 24 Dec 1882, baptized 25 Mar 1883 Church of the Redemption, Philadelphia, d. 11 Nov 1905 Philadelphia, buried 14 Nov 1905 Mount Moriah Cemetery, m. Magruder Manry Cameron on 7 Nov 1903 in Wilmington, New Castle, Delaware. Magruder b. 1 Jan 1878 Philadelphia, d. 18 Jul 1906, Philadelphia, buried 21 Jul 1906 North Cedar Hill Cemetery. They had two known children: Mary E. and Ella (Ellen) Gordon. 3. Sadie Walker, b. 13 Jan 1885 Philadelphia, d. 20 Feb 1953 Philadelphia, cremated, m1 to Unknown Cookson. They had one known child: Arthur E. Cookson. M2 to Unknown Kleinfelder. They had no known children. 4. Anna Walker, b. 1 Nov 1888 Philadelphia, d. 27 Oct 1938 Philadelphia, buried 31 Oct 1938 Greenwood Cemetery Philadelphia, m. Henry “Harry” Riley about 1905. Harry was born about 1883. Date of death aft 1920. They had four known children: Henry “Harry” Riley, Raymond Thomas Riley, Charles Riley, and Anna Riley. William Zed Walker: born 2 Aug 1860 and baptized 9 Sep 1860, died 10 Apr 1941. He and his family will be the subject of a separate post. 1. St Michaels (Ashton Under Lyne, Lancashire, England), “Baptisms,” p.24, 30 Jan 1844, Phoebe Walker dau. of Abraham & Ann Walker; FHL microfilm 1,538,434. 2. St Michaels (Ashton Under Lyne, Lancashire, England), “Burials,” p. 246, line 2, Phoebe dau. of Abraham Walker, 4 Aug 1844; FHL microfilm 1,550,971. 3. Church of the Redemption (Philadelphia, Pennsylvania, Philadelphia County), “Church of the Redemption (Spring Garden),” Records 1846-1850 by Rev. George A. Duborow; FHL microfilm 2,048,314, item Baptism Jeremiah Walker 11 Jan 1848. 4. 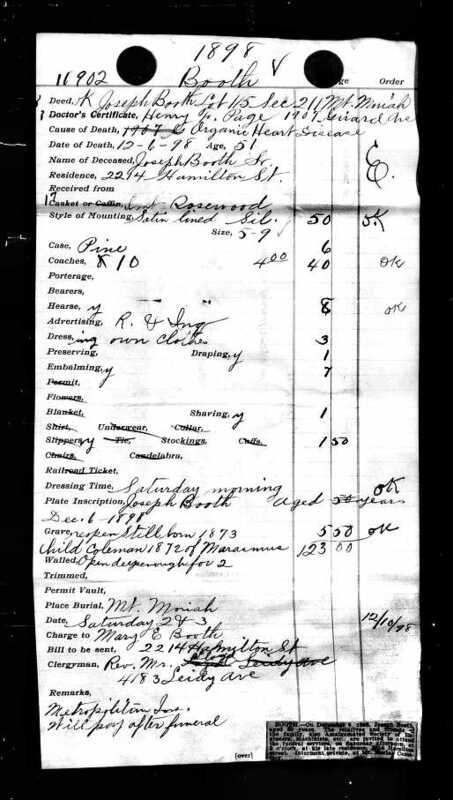 Pennsylvania U.S. Census Bureau, Mortality Schedule, M1838, 11 rolls: pg 2 Seventh Precinct, Spring Garden, Philadelphia, 25, Jeremiah Walker, aged 3/12, cause of death unknown; digital image, The Generations Network, Inc., “U. S. Federal Census Mortality Schedules, 1850-1880,” Ancestry. 5. 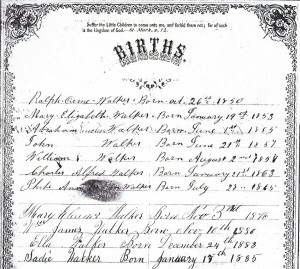 Church of the Redemption (Philadelphia, Pennsylvania, Philadelphia County), “Baptismal Record,” Ralph Orme Walker; FHL microfilm 1,731,982, item shows birth date of 26 Oct 1850. 6. John or Phoebe Walker Family Bible, family pages; Photocopy held by Private, Mr. Ralph Walker to Miss N. Mary A. Saxon, 18 Aug 1871. 7. Pennsylvania Department of Health, death certificate 120632 (1908), Mary A. Dixon, died 22 Dec 1908, buried 26 Dec 1908 Mount Moriah; Department of Vital Statistics, New Castle. Cit. Date: 5 Jul 2015. 8. Pennsylvania Philadelphia City Death Certificates 1803-1915, Ralph O. Walker death date 13 Dec 1897, burial 19 Dec 1897 Mount Moriah. Rec. Date: 20 Jun 2008. 9. Pennsylvania Philadelphia City Death Certificates 1803-1915, #15792, Kate Walker, death date 29 Jan 1901, burial 2 Feb 1901 Mount Moriah. Rec. Date: 20 Jun 2008. 10. Pennsylvania Department of Health, death certificate 120632 (1908), Mary A. Dixon, died 22 Dec 1908, buried 26 Dec 1908 Mount Moriah; Department of Vital Statistics, New Castle. Cit. Date: 5 Jul 2015. 11. (Pennsylvania), “Pennsylvania, Church and Town Records 1708-1985,” Mary Elizabeth, daughter of Abram & Ann Walker, born 1 Jan 1852; digital images, Ancestry, “FHL Film #1731982” Cit. Date: 5 Jul 2015. 12. John or Phoebe Walker Family Bible, family pages; Photocopy held by Private. Miss Mary E. Walker to Mr. Joseph Booth 1 Oct 1869. Cit. Date: 14 Jan 2012. 13. 1870 U.S. census, Philadelphia County, Pennsylvania, population schedule, Philadelphia, p. 63, dwelling 771, family 924, Mary Walker Booth; digital images, Ancestry; citing National Archives and Records Administration microfilm M593, roll M593 1398. Cit. Date: 30 Jun 2008; Family #924 Joseph Booth age 22 Engine Builder, Mary Booth age 20 Keeping House. Census records married within last 12 months, specifically October. 14. Pennsylvania City of Philadelphia, Philadelphia City Death Certificates 1803-1915, 11902, Joseph Booth died 6 Dec 1898, buried 10 Dec 1898 Mount Moriah; digital image, Family Search, “Pennsylvania, Philadelphia City Death Records 1803-1915,” Rec. Date: 20 Jun 2008. 15. Pennsylvania Department of Health, death certificate 11895 (1938), Mary Elizabeth Booth, born 11 Feb 1852, died 27 Feb 1938, buried 2 Mar 1938 Mount Moriah, Father Abraham Walker, Lancashire, Mother Anne Orme, Lancashire, Spouse, Joseph Booth; Department of Vital Statistics, New Castle. Cit. Date: 5 Jul 2015. 16. Church of the Redemption (Philadelphia, Pennsylvania, Philadelphia County), Abraham Walker, son of Abram and Ann, baptized 13 Jun 1855, born 1 Jun 1854; FHL microfilm 1,731,982. Cit. Date: 7 Jul 2015. 17. John or Phoebe Walker Family Bible, family pages; Photocopy held by Private. Mr. Abraham Walker to Miss Eleanor Agar, 7 Feb 1876. Cit. Date: 15 Jan 2012. 18. Pennsylvania City of Philadelphia, Philadelphia City Death Certificates 1803-1915, Physician’s Certificate, Elnor Walker, died 9 Sep 1879; digital image, Family Search, Rec. Date: 20 Jun 2008. Cit. Date: 15 Jan 2012. 19. Pennsylvania Department of Health, death certificate 47773 (1936), Theresa Berger Walker, age 75, born 12 Sep 1860, died 5 May 1936, Father John Berger, France, Mother Margaret Uikrohr, Germany, Spouse Abraham Walker, buried 7 May 1936 South Side Cemetery; Department of Vital Statistics, New Castle. 21. Church of the Redemption (Philadelphia, Pennsylvania, Philadelphia County), John Walker, son of Abram and Ann Walker, baptized 9 Sep 1860, born 21 Jun 1858; FHL microfilm 1,731,982. Cit. Date: 7 Jul 2015. 22. John or Phoebe Walker Family Bible, family pages; Photocopy held by Private. Mr. John Walker to Miss Annie E. McCarrick 1 Jan 1880. 24. Pennsylvania City of Philadelphia, Philadelphia City Death Certificates 1803-1915, Annie Walker, age 41, died 25 Aug 1902, buried 28 Aug 1902 Mount Moriah; digital image, Family Search Rec. Date: 20 Jun 2008. Cit. Date: 9 Jul 2015. 25. “Pennsylvania, Church and Town Records 1708-1985,” Burial Record, Ella Cameron, 14 Nov 1905, Sec 207, Lot B, Div 21, next to Annie Walker buried 28 Aug 1902; digital images, Ancestry, “Oliver Bair Funeral Home Records,” Cit. Date: 9 Jul 2015. 27. Church of the Redemption (Philadelphia, Pennsylvania, Philadelphia County), Phoebe Ann Lincoln Walker, daughter of Abram and Ann, baptized 8 Nov 1865, birth 28 Jul 1865; FHL microfilm 1,289,306.